Our work is only possible because we partner with others to achieve our objectives. 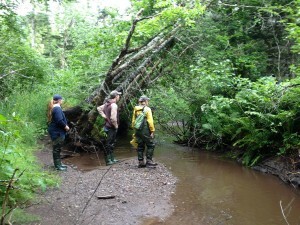 NSLC Adopt A Stream is one of our major partners. The program provides funding and technical support to help community volunteer organizations like ourselves to undertake projects to protect, repair and improve the aquatic and riparian habitats. Each year NSLC Adopt a Stream spends time on the river with our staff to evaluate the progress of our summer work plan and where necessary provide valuable advice. In the photo below Amy Weston is spending a day on the Waugh’s River with our crew.